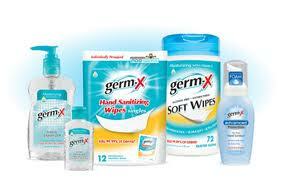 According to the World Health Organization and the Center for Disease Control, products like Germ-X are beneficial. They only confirmed what I already knew. When it comes to germs, my imagination knows no limits. From trips through the sinus passages on The Magic School Bus to the 2006 episode of The Office called “The Convention” in which Michael Scott and Dwight Schrute look at a hotel room under a black light, I’ve learned to fear the microscopic and protect myself with an invisible alcohol-based force field. Michael Scott: Whoa. What are all those stains? Michael Scott: Oh... I hope it's urine! Long before Monk’s obsessive compulsive behavior was popularized for television, I had mastered the no-touch bathroom regimen. The first time I realized my bathroom habits were nontraditional was when my mother-in-law went on a trip with me. It was a Chevron bathroom, one of the worst kind; gas station bathrooms are disgusting, barely a step above National Parks. I kicked open the swinging door, assessed the best approach, then tore off a small piece of paper towel to use like an oven mitt. First, I used the paper towel to push the lever to get more paper towel. I used it to open the stall door, slide the lock into place, and flush the toilet that was never touched by any part of my body. Washing hands is the best part of public bathrooms, but then getting out of the bathroom can be problematic. What should I do with the paper towel with which I dried my hands? It’s needed to open the door, then I have to dispose of it properly. Hopefully there’s a trash can near the door, preferably one that doesn’t have a swinging lid because that takes precision: push and drop before the lid swings too close and touches my hand or the washing process has to be redone. This part has to be timed like an Olympian passing the baton. My mother-in-law watched me as she recklessly touched every microbe-infested surface. The 2009-2010 swine flu pandemic had its perks. I was introduced to new varieties of Germ-X; citrus scented, aloe infused, and fresh breeze scent. That was over three years ago, and my obsession with Germ-X has increased. I feel the need to carry small, pocket-sized bottles of Germ-X in my bags. I have travel-sized Germ-X approved by Homeland Security. I feel safer having Germ-X than I do from having extra airport security. I have larger pump bottles of Germ-X in my car; that’s the first thing I do when I get in after shopping, rub my hands liberally with original Germ-X. I also have economy-sized bottles throughout my house; beside the kitchen sink, in both bathrooms, and next to my bed. I would never stay in a hotel without it. There are times that my obsession with Germ-X effects how I interact with other people. For example, my students—who come to class sick or with allergies—cough and sneeze on their papers before turning them in. I can’t take them. Students have to stack their papers on the desk. Eventually I gel up before grabbing the papers, stuffing them into a bag, and re-gelling. Politely shaking hands means fake smiling as the microbes race toward me. I have to quickly kill them. I can sense germs. Test driving cars requires liberal amounts of Germ-X to counter the steering wheel germs. I read somewhere that the dirtiest items in our culture are hospital remote controls. They have become the standard by which I judge the filthiness of all other material culture. Door knobs are slightly better than hospital remotes. Anything in a lobby, any lobby, is dirty. Hand railings, chair arms, lockers, gym equipment, money, and windshield squeegees. But tied with hospital remote controls is DVD rentals. When I rented Season 2 of The Office, I used Germ-X on the DVD cases. I laughed uncontrollably at Michael Scott’s insane fear of germs and bacteria. Kathi, a friend of mine added ATMs and fuel pump handles to the list. I have to agree with him. They are gross too.